Hercules was the Roman name for the greatest hero of Greek mythology -- Heracles. Like most authentic heroes, Heracles had a god as one of his parents, being the son of the supreme deity Zeus and a mortal woman. Zeus's queen Hera was jealous of Heracles, and when he was still an infant she sent two snakes to kill him in his crib. Heracles was found prattling delighted baby talk, a strangled serpent in each hand. When he had come of age and already proved himself an unerring marksman with a bow and arrow, a champion wrestler and the possessor of superhuman strength, Heracles was driven mad by Hera. In a frenzy, he killed his own children. To atone for this crime, he was sentenced to perform a series of tasks, or "Labors", for his cousin Eurystheus, the king of Tiryns and Mycenae. By rights, Hercules should have been king himself, but Hera had tricked her husband Zeus into crowning Eurystheus instead. As his first Labor, Heracles was challenged to kill the Nemean lion. This was no easy feat, for the beast's parentage was supernatural and it was more of a monster than an ordinary lion. Its skin could not be penetrated by spears or arrows. Heracles blocked off the entrances to the lion's cave, crawled into the close confines where it would have to fight face to face and throttled it to death with his bare hands. Ever afterwards he wore the lion's skin as a cloak and its gaping jaws as a helmet. King Eurystheus was so afraid of his heroic cousin that when he saw him coming with the Nemean lion on his shoulder, he hid in a storage jar. From this shelter he issued the order for the next Labor. Heracles was to seek out and destroy the monstrous and many-headed Hydra. The mythmakers agree that the Hydra lived in the swamps of Lerna, but they seem to have had trouble counting its heads. Some said that the Hydra had eight or nine, while others claimed as many as ten thousand. All agreed, however, that as soon as one head was beaten down or chopped off, two more grew in its place. To make matters worse, the Hydra's very breath was lethal. Even smelling its footprints was enough to kill an ordinary mortal. Fortunately, Heracles was no ordinary mortal. He sought out the monster in its lair and brought it out into the open with flaming arrows. But now the fight went in the Hydra's favor. It twined its many heads around the hero and tried to trip him up. It called on an ally, a huge crab that also lived in the swamp. The crab bit Heracles in the heel and further impeded his attack. Heracles was on the verge of failure when he remembered his nephew, Iolaus, the son of his twin brother Iphicles. Iolaus, who had driven Heracles to Lerna in a chariot, looked on in anxiety as his uncle became entangled in the Hydra's snaky heads. Finally he could bear it no longer. In response to his uncle's shouts, he grabbed a burning torch and dashed into the fray. Now, as soon as Heracles cut off one of the Hydra's heads, Iolaus was there to sear the wounded neck with flame. This kept further heads from sprouting. Heracles cut off the heads one by one, with Iolaus cauterizing the wounds. Finally Heracles lopped off the one head that was supposedly immortal and buried it deep beneath a rock. The third Labor was the capture of the Cerynitian hind. Though a female deer, this fleet-footed beast had golden horns. It was sacred to Artemis, goddess of the hunt, so Heracles dared not wound it. He hunted it for an entire year before running it down on the banks of the River Ladon in Arcadia. Taking careful aim with his bow, he fired an arrow between the tendons and bones of the two forelegs, pinning it down without drawing blood. All the same, Artemis was displeased, but Heracles dodged her wrath by blaming his taskmaster Eurystheus. Eurystheus was very pleased with himself for dreaming up the next Labor, which he was sure would humiliate his heroic cousin. Heracles was to clean out the stables of King Augeas in a single day. Augeas possessed vast herds of cattle which had deposited their manure in such quantity over the years that a thick aroma hung over the entire Peloponnesus. Instead of employing a shovel and a basket as Eurystheus imagined, Heracles diverted two rivers through the stableyard and got the job done without getting dirty. But because he had demanded payment of Augeas, Eurystheus refused to count this as a Labor. The sixth Labor pitted Heracles against the Stymphalian birds, who inhabited a marsh near Lake Stymphalus in Arcadia. The sources differ as to whether these birds feasted on human flesh, killed men by shooting them with feathers of brass or merely constituted a nuisance because of their number. Heracles could not approach the birds to fight them - the ground was too swampy to bear his weight and too mucky to wade through. Finally he resorted to some castanets given to him by the goddess Athena. By making a racket with these, he caused the birds to take wing. And once they were in the air, he brought them down by the dozens with his arrows. Queen Pasiphae of Crete had been inspired by a vengeful god to fall in love with a bull, with the result that the Minotaur was born -- a monster half-man and half-bull that haunted the Labyrinth of King Minos. Pasiphae's husband was understandably eager to be rid of the bull, which was also ravaging the Cretan countryside, so Hercules was assigned the task as his seventh Labor. Although the beast belched flames, the hero overpowered it and shipped it back to the mainland. It ended up near Athens, where it became the duty of another hero, Theseus, to deal with it once more. Next Heracles was instructed to bring Eurystheus the mares of Diomedes. These horses dined on the flesh of travelers who made the mistake of accepting Diomedes' hospitality. In one version of the myth, Heracles pacified the beasts by feeding them their own master. In another, they satisfied their appetites on the hero's squire, a young man named Abderus. In any case, Heracles soon rounded them up and herded them down to sea, where he embarked them for Tiryns. Once he had shown them to Eurystheus, he released them. They were eventually eaten by wild animals on Mount Olympus. The ninth Labor took Heracles to the land of the Amazons, to retrieve the belt of their queen for Eurystheus' daughter. The Amazons were a race of warrior women, great archers who had invented the art of fighting from horseback. Heracles recruited a number of heroes to accompany him on this expedition, among them Theseus. As it turned out, the Amazon queen, Hippolyte, willingly gave Hercules her belt, but Hera was not about to let the hero get off so easily. The goddess stirred up the Amazons with a rumor that the Greeks had captured their queen, and a great battle ensued. Heracles made off with the belt, and Theseus kidnapped an Amazon princess. In creating monsters and formidable foes, the Greek mythmakers used a simple technique of multiplication. Thus Geryon, the owner of some famous cattle that Heracles was now instructed to steal, had three heads and/or three separate bodies from the waist down. His watchdog, Orthrus, had only two heads. This Labor took place somewhere in the country we know as Spain. The hound Orthrus rushed at Heracles as he was making off with the cattle, and the hero killed him with a single blow from the wooden club which he customarily carried. Geryon was dispatched as well, and Heracles drove the herd back to Greece, taking a wrong turn along the way and passing through Italy. The Hesperides were nymphs entrusted by the goddess Hera with certain apples which she had received as a wedding present. These were kept in a grove surrounded by a high wall and guarded by Ladon, a many-headed dragon. The grove was located in the far-western mountains named for Atlas, one of the Titans or first generation of gods. Atlas had sided with one of his brothers in a war against Zeus. In punishment, he was compelled to support the weight of the heavens by means of a pillar on his shoulders. 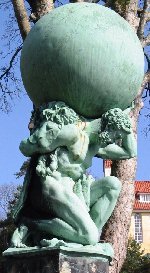 Heracles, in quest of the apples, had been told that he would never get the them without the aid of Atlas. The Titan was only too happy to oblige. He told the hero to hold the pillar while he went to retrieve the fruit. But first Heracles had to kill the dragon by means of an arrow over the garden wall. Atlas soon returned with the apples but now realized how nice it was not to have to strain for eternity keeping heaven and earth apart. Heracles wondered if Atlas would mind taking back the pillar just long enough for him to fetch a cushion for his shoulder. The Titan obliged and Heracles strolled off, neglecting to return. As his final Labor, Heracles was instructed to bring the hellhound Cerberus up from Hades, the kingdom of the dead. The first barrier to the soul's journey beyond the grave was the most famous river of the Underworld, the Styx. Here the newly dead congregated as insubstantial shades, mere wraiths of their former selves, awaiting passage in the ferryboat of Charon the Boatman. Charon wouldn't take anyone across unless they met two conditions. Firstly, they had to pay a bribe in the form of a coin under the corpse's tongue. And secondly, they had to be dead. Heracles met neither condition, a circumstance which aggravated Charon's natural grouchiness. But Heracles simply glowered so fiercely that Charon meekly conveyed him across the Styx. The greater challenge was Cerberus, who had razor teeth, three (or maybe fifty) heads, a venomous snake for a tail and another swarm of snakes growing out of his back. These lashed at Heracles while Cerberus lunged for a purchase on his throat. Fortunately, the hero was wearing his trusty lion's skin, which was impenetrable by anything short of a thunderbolt from Zeus. Heracles eventually choked Cerberus into submission and dragged him to Tiryns, where he received due credit for this final Labor. Heracles had a great many other adventures, in after years as well as in between his Labors. It was poisonous Hydra venom that eventually brought about his demise. He had allowed a centaur to ferry his wife Deianara across a river, and the centaur had attacked her on the other side. Heracles killed him with an arrow, but before he died he told Deinara to keep some of his blood for a love potion. Deinara used some on Heracles' tunic to keep him faithful, little realizing that it had been poisoned with Hydra venom from the arrow. Heracles donned the tunic and died in agony. Heracles was the only hero to become a full-fledged god upon his demise, but even in his case there was his mortal aspect to be dealt with. By virtue of his spectacular achievements, even by heroic standards, he was given a home on Mount Olympus and a goddess for a wife. But part of him had come not from his father Zeus but from his mortal mother Alcmene, and that part was sent to the Underworld. As a phantasm it eternally roams the Elysian Fields in the company of other heroes. Mesopotamia: representation of Marduk, the patronal god of the city of Babylon in Ur whose cult replaced the cult of Bel. Marduk was the most popular Babylonian god in the fourteenth century BC and was considered the god from which all others derived their power. His popularity arose from his triumphant duel with Tiamat, the celestial Dragon, as he created all from Chaos. He is said to have brought order from Chaos when he slew the Dragon with his mace and cut her body into two parts. One part was placed above and became the heavens, one he placed below his feet and became the earth. Her breasts became the mountains, the Tigris and Euphrates flowed from her eyes, the sea sprang from her body, her blood was oil. He then made a path for the sun to follow, divided time into a calendar of twelve months of thirty days each and created man from the bones of Qingu, ally of and lover to Tiamat. All ziggurats were dedicated to Bel-Marduk. The most famous ziggurat, Esagila, in the city of Babylon became famous as the Tower of Babel. See the Mesopotamian legends of Andromeda, Cetus, Draco, Hydra and Perseus. 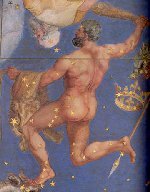 The constellations surrounding Hercules include Bo�tes as the Titan Atlas with the inclusion of the Corona Borealis as the globe on the giant's shoulders, Leo as the Nemean lion, Cancer the crab, Hydra the sea serpent and Draco as the defeated dragon, Ladon, who protected the golden apple tree of the Hesperides. See the Greek legends of Andromeda, Cancer, Centaurus, Draco, Hydra, Leo, Sagitta and Perseus.